Seven members of a family belonging to the minority Yazidi community have been murdered in northern Iraq, police say. Officers said a mother and father and their four adult children were shot dead when gunmen burst into their home in the town of Sinjar, west of Mosul. 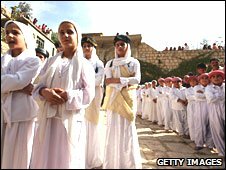 The Yazidis are an ancient, religious sect and there have been a number of attacks on them in Iraq in the past. In August 2007, some 400 people were killed in the Sinjar area in multiple bomb blasts targeting Yazidis. Thought to number about 500,000, the Yazidis are to be found in Iran, Russia and Turkey, but the largest number are in northern Iraq. Their religion is a blend of Zoroastrianism, Islam and other faiths. Some Muslims have accused them of being devil-worshippers, since they revere an angel in the form of a blue peacock. It is a charge the Yazidis reject. A number of attacks against Yazidis in recent years have been blamed on al-Qaeda in Iraq which views them as infidels.